Kansas City, Mo. 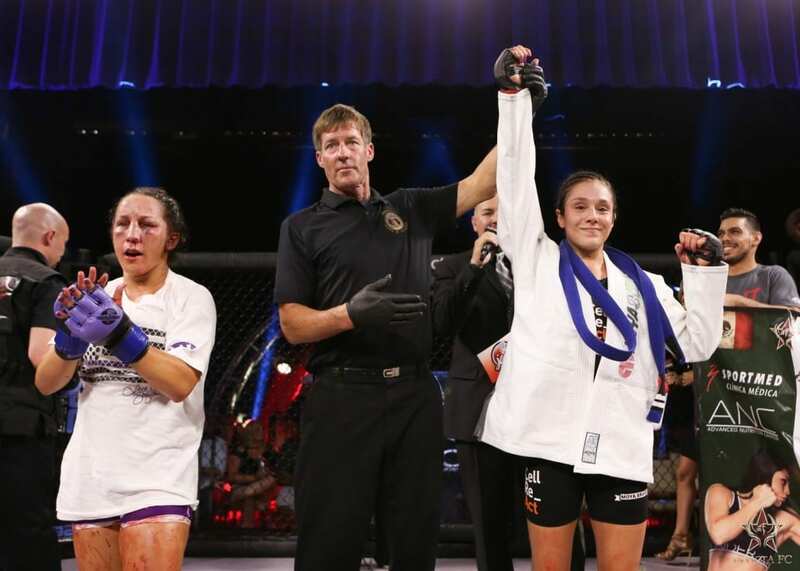 — On Friday, July 29, Invicta Fighting Championships hosted Invicta FC 18: Grasso vs. Esquibel from the historic Scottish Rite Temple. The event streamed live and exclusively on UFC Fight Pass beginning at 8 p.m. ET. 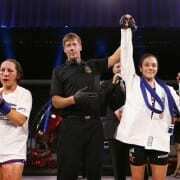 In the night’s main event, Mexico’s Alexa Grasso moved to 8-0 after outstriking Jodie Esquibel for three rounds. Grasso controlled range in the opening frame, landing her right hand at will. Esquibel struggled to get inside as Grasso scored from distance. Esquibel marched forward in round two, but Grasso made her pay with well-placed counter shots. Grasso’s heavy hands took their toll in the final round, as Esquibel’s nose poured blood. Esquibel showed a lot of heart, lasting to the final bell, but it was Grasso’s fight on the scorecards. Polish flyweight Agnieszka Niedźwiedź remained unbeaten, topping late-notice opponent Christine Stanley by unanimous decision. Niedźwiedź peppered Stanley with jabs to open the contest, but Stanley countered with overhand rights. Once Niedźwiedź found her range, she changed levels and put Stanley on the ground. Stanley fought hard to get back to her feet, but Niedźwiedź’s takedowns were relentless. The pair continued to trade in round two, with Stanley landing the heavier shots, but she couldn’t stop the takedowns of Niedźwiedź. It was more of the same in the final frame as Niedźwiedź sealed the win on the ground. 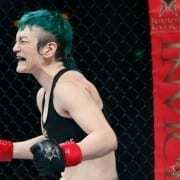 Japan’s MIZUKI scored another big win inside the Invicta cage, submitting Lynn Alvarez by armbar. The pair opened tentatively, but MIZUKI quickly took the fight to the ground and mounted Alvarez. She scored with hammerfists and elbows, but Alvarez was able to spin into top position as the round closed. The second stanza opened with a brief firefight, before MIZUKI used a hip toss to get Alvarez to the ground. She took Alvarez’s back and then transitioned to the armbar to coerce the tap. Cindy Dandois earned a first-round submission win against UFC veteran Jessamyn Duke. Dandois earned a takedown in the opening seconds, but Duke was able to get back to her feet. It was short-lived as Dandois earned a head-and-arm throw into side control. She slapped on a scarf hold armlock and Duke quickly tapped. Australia’s Megan Anderson continued her march through the featherweight division, stopping UFC veteran Peggy Morgan in round one. Anderson’s power punching was on display right off the bat. Morgan tried for a takedown, but Anderson was able to separate and land with heavy shots. Morgan crashed to the canvas after a left hand, but was able to survive. She worked back to her feet, but the damage was done as her cheek swelled badly. Anderson dropped Morgan again with a right hand, earning the TKO win. Atomweight Tessa Simpson put on a striking clinic early and survived late, taking a decision win over veteran Simona Soukupova. Simpson scored with combinations in the first rounding, turning the face of Soukupova red. It was more of the same in round two as Simpson controlled the range and Soukupova struggled to get inside. The tables turned in round three, as Soukupova began landing her right hand at will. She dropped Simpson late in the fight and flurried, but it was too little, too late, as the judges handed Simpson the victory. 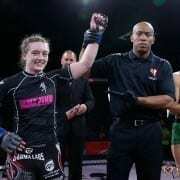 Aspen Ladd kept her undefeated record intact, stopping promotional newcomer Jessica Hoy by second-round TKO. Ladd was aggressive on the feet, landing jabs and hooks. Hoy took the action to the clinch, slowing Ladd’s offense. In round two, Ladd brought the fight to the ground with a beautiful toss, landing in side control. She moved to mount and delivered a series of punches and elbows to earn the stoppage. Kicking off the action, bantamweight Sijara Eubanks earned her second win inside the Invicta cage, spoiling the professional debut of Amberlynn Orr. Orr scored on her feet early, landing with kicks and combinations. Eubanks responded with a takedown and she quickly took over. She unleashed a barrage of punches and elbows from the crucifix position, forcing the referee to intervene.